The pattern is for a dress for Barbie worked in continuous rounds from the top down. I used Patons 4ply soft cotton so its important to check tension if using a different 4ply yarn as any slight variation can make a big difference in the size. Crochet cotton is not suitable as its too fine. 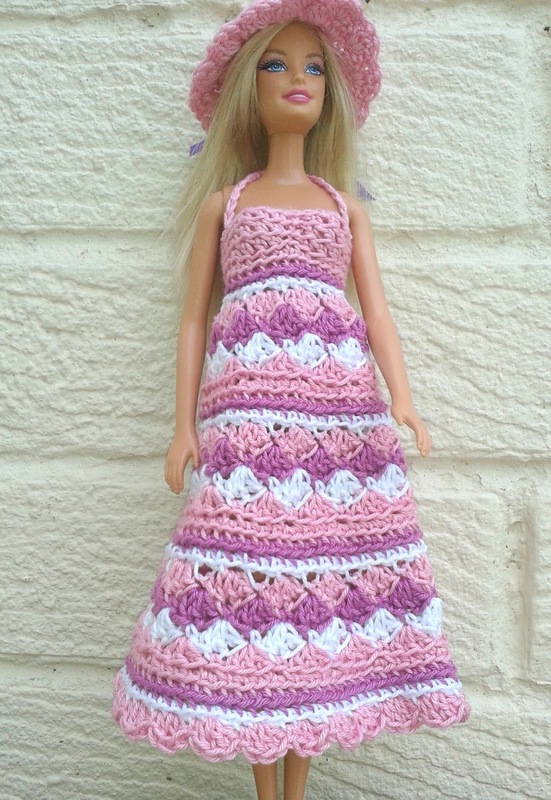 The dress is very close fitting and fits the latest Barbie model. For a larger fashion doll add a few extra dc at the beg. This is a great design to use up all those small bits of yarn in your stash. I used shoelace ribbon for the hat but a crochet chain would work too. 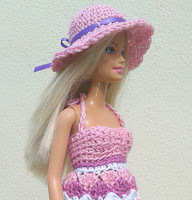 If you make this dress and hat and have any queries or find any mistakes please let me know. This dress is a close fit so any differences in yarn weight will make a smaller or larger garment. Cotton thread is not suitable. To finish: neaten all ends.